Notably, infrastructure—which the report considers to be among the basic requirements for a globally competitive economy—continues to be a major bottleneck in Africa. According to the report, Africa’s performance in transport infrastructure quality and energy supply quality have actually dropped 6 and 3 percent, respectively, over the last 10 years. 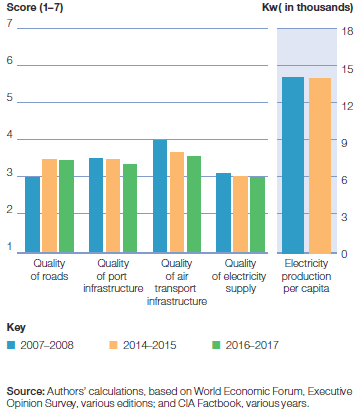 Figure 1 indeed shows that infrastructure quality in many different subsectors on the continent is decreasing. In some cases, (e.g., electricity production), supply is only just keeping up with demand. In addition, while Africa is seeing improvements in some areas, the gap between the continent and other regions of the world is widening. The report is careful to note that these averages are not necessarily indicative of specific country, and even regional, performances across all infrastructure indicators. For example, South Africa and Namibia boast port quality similar to developed countries. Source: WEF Africa Competitiveness Report 2017. The authors point out a recurring theme when it comes to African infrastructure: the financing gap. As of 2015, this gap stood at $93 billion per year. As Brookings scholars have noted before, the particularities of infrastructure make attracting private investors difficult, meaning that new tools, such as pension funds or greenfield financing by development banks, should be leveraged. 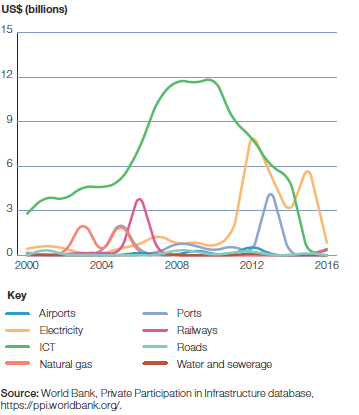 While private investment has played a major role in information and communication technologies (ICTs) investment in recent years (for a breakdown of infrastructure financing sources across sectors, see the Brookings report Financing African infrastructure: Can the world deliver? ), the report shows that it has dropped immensely. The authors express concern that the low availability of ICT infrastructure besides mobile devices, such as broadband internet, will prevent the continent from entering the Fourth Industrial Revolution. Financing African infrastructure: Can the world deliver?